Avinash “Avi” Thakur, a Ph.D. candidate in the Department of Physics in the College of Arts and Sciences (A&S), recently made headlines with his role in the development of a novel class of nanomaterials that could possibly improve cancer detection. The Indian-born student is unmoved by the praise, saying A&S—and Movileanu’s lab, specifically—affords him opportunities to design his own projects and experiments. 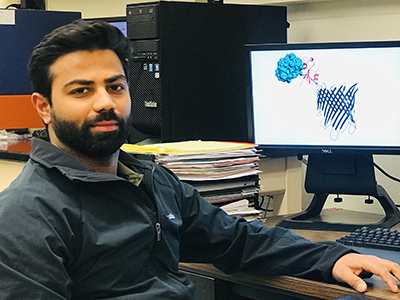 A&S recently caught up with Thakur—whose expertise combines protein engineering, design and application—to discuss his time in A&S. Your background includes biochemistry and biotechnology. How did it prepare you for Syracuse University? Yes. I design and develop barrel-like sensors that are 100,000 times thinner than a human hair. These sensors detect proteins and transduce [convert] that detection into an electrical current as an output.